The sun was out today, so we went along to the East Neuk, that incredibly well-kept Fife secret. For those not in the know, let me induct you into the Illuminati: Fife, a region known for its mining communities (now ex-mining communities) and St Andrews, home of golf, has on its south-eastern coast a string of fishing villages that are, well, just endlessly photogenic! Best known of these villages is Anstruther. I was saying today, not for the first time, that quite a few places in Fife should take a leaf out of Anstruther’s book: whatever it’s done over the last few years, it’s done right. Despite the decline of the fishing industry, it’s thriving, and growing, partly at least because of the decision to invest in harbour pontoons which now attract pleasure boats as well as fishermen. Its fish and chip shop is rightly renowned, although you can also get other eating options. St Monans has a great plant nursery we also visited today; Pittenweem is equally picturesque down at the harbour; but in terms of scenery, Crail (pictured here and at the top of the page) is probably my favourite. The gable ends of the houses, by the way, are described as ‘crow stepped,’ and I remember at primary school being told it was because the traders with the so-called ‘Low Countries,’ (modern day Holland and Belgium) in centuries past liked the architecture there so much they replicated it when they got home. The truth is slightly more complex: the area was deliberately settled with Flemish traders, who then brought their architecture with them. …and that’s it, really. A hidden string of pearls, just a few miles from home. And the real kicker is, the micro climate there means that it’s drier than the rest of the county, so even if it’s raining at home, along the coast there’s a decent chance of sun! Here’s the thing. 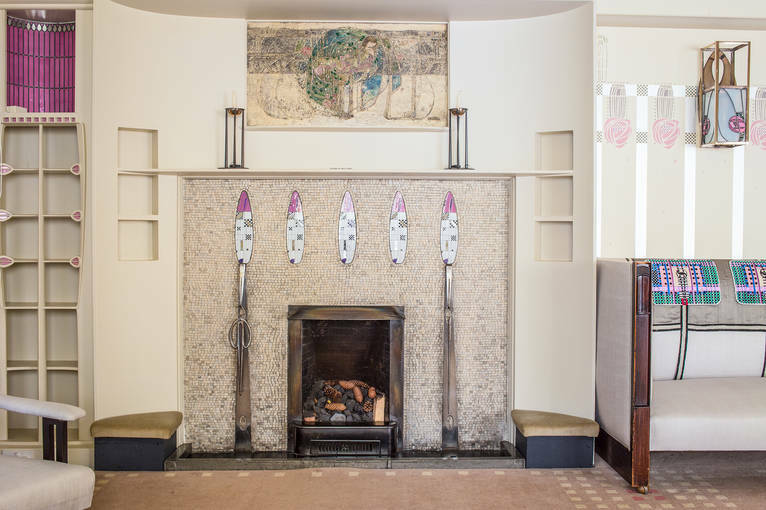 In May, we’re going to Hill House, the Charles and Margaret Rennie Mackintosh designed house in Helensburgh. To stay. I know – who knew you could actually stay there? 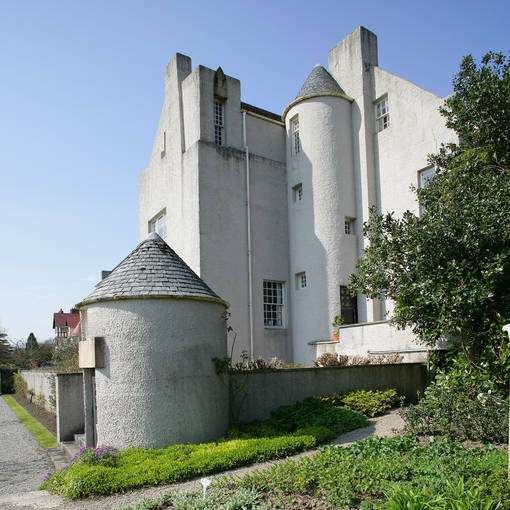 The pictures (courtesy of the National Trust for Scotland) give you an idea of just how stunning a place it is: we’ve visited the bit you visit twice, but never had a scooby that there was an apartment upstairs you could actually have as a holiday let. 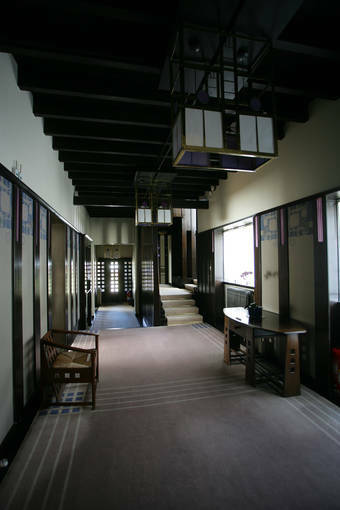 The NTS website gives you a good idea of what the place is all about, but for those of you who’ve never heard of the Mackintoshes, he was an architect and she was an artist and designer who, as a husband and wife team, created not just the most outstanding pieces of modern architecture in this country – the Glasgow School of Art is the best known example – but also designed the interiors, down to the last door knob. I’m no architecture student, but there are clearly resonances with Gaudi, as well, I suspect, as Lloyd Wright. So, in May, just before the whole place gets enclosed in plastic to ward off the effects of the weather and preserve it for future generations, we’re staying up a spiral staircase, away from the madding crowds going round the rest of the house, in what was the schoolroom. And here’s another intriguing thing: the website, for some reason, says ‘Like all rooms once the domain of children, it has the feeling of a place where much spirit and energy have been expended.’ Do they mean it’s haunted? I shall of course report back. I plan to take a guitar, and some recording equipment, so if the Blackie children join in the song, there’ll be evidence! P.S. You can read about why they’re ‘boxing’ the Hill House, and how you can contribute to the fund raising appeal, here. There’s even a video featuring beefcake TV history presenter, Neil Oliver, who’s also NTS President. Adverts down here. Nothing you’d want, probably. Some of the greatest, most effortless-sounding albums were a weary long trauchle (to use a Scots word) to make. To take one example, Fleetwood Mac’s Rumours took over a year, and yet sounds to this day as if the whole thing happened spontaneously over a sunny LA weekend. Apparently they took three days just to agree over the tuning of a piano; only Christine McVie’s classic song ‘Songbird’ was done and dusted in the course of a night, and that took a truckload of champagne to get it over the line, so the story goes. Of course, the French Prosecco was kind of the least The Mac were doing in the course of the Rumours sessions; and then there was the small matter of them all breaking up with each other at the same time. In comparison, and with all due respect to their rock n’ rollness, I can’t really imagine Norman Lamont and the Heaven Sent using much more than a strong brew of Tetley’s during the making of In Another Life. According to the man himself, the original intention was simple – create an album using a small multi-track recorder in a living room, with the whole band playing live, and minimal overdubs. That, however, was in late 2015, and over two and a half years later, at least three different recording spaces, a producer, a cover designer, and a pro master wizard later, the album is finally, officially out. And yet it sounds effortless! Norman has described the overall style as ‘pop,’ and I guess, in some ways, it may serve as the gateway drug to some of his darker material, such as ‘Fingerpuppet,’ or ‘The Last Man to Touch You,’ on the album before this, All The Time in Heaven. Nevertheless, bright and breezy folk-rock like In Another Life’s opener, ‘End of Tears,’ is hard to make sound as effortless as this. Similarly, the way Norman leans into ‘Well, I’m the type of guy…’ on the next track, ‘Green Lights All The Way,’ sounds as easy as the narrator’s lucky life, but, as I can personally testify, it takes talent – and time – to sound that easy. Throughout, Norman’s intention to get things as good they can be shines through. ‘The Ballad of Bob Dylan’ is probably the song Norman’s known best for: but here it gets a radical treatment that keeps the core shaggy dog story front and centre whilst mixing up pace and instrumentation all around it. A modern classic! Whilst the overall sound is what I’d describe as folk rock, or maybe acoustic rock, there are a couple of departures: the jaunty spirit of ‘In Another Life,’ is such an earworm that I can forgive him for reggae, one of my least favourite genres; and ‘Damn Grey’ and ‘Goodbye Song’ both exhibit jazz influences. The other highlight, unsurprisingly to long-term Norman-watchers, is his facility with words. The music may sound easier than it is, but the lyrics are at all times smartly turned out, and on occasion have a hidden bite. ‘You Made Me Do It,’ with its refrain of ‘You made me this way,’ leaves the listener in no doubt who the narrator holds responsible. In another context, ‘Damn Grey’ deals with the weighty topic of depressive illness. Favourites? Surprisingly perhaps for a fellow devotee of the Cohen/Cave dark axis, I’m really drawn to the upbeat stuff! Those sly vocals in ‘Green Lights All the Way,’ with its earworm of a tune, for example. ‘End of Tears,’ is another stand out. Incidentally, if you go through Norman’s website to sign up for this, you get an incredibly generous package of stories behind the songs, videos, and bonus tracks. Strongly recommended, it emphasises the care, love, and sheer blood sweat and tears went into the making of the album. It’s just that it sounds so effortless. P.S. You can also get a deal on the launch gig, which is next Thursday, 22nd March, at the Voodoo Rooms. Adverts be below here. Not Norman. So, when I was reviewing the two amplifiers I use recently, I mentioned I was planning to review my two main guitars, to compare and contrast, and I’m a man, at least in this regard, of my word. I suppose before I start I should confess these are not my only guitars. The others that I own (I had a gorgeous Danelectro 12 string on loan from Mr Brutal for a while, but he’s borrowed it back at the moment) are: a Kiso-Suzuki copy of the Gibson J200, which I think I may have mentioned before, with a bridge so cracked it would cost more to repair than it’s worth; a Freshman Acoustic 12-string which these days is tuned to Open D and used exclusively for slide guitar; and a blues box guitar, picked up in a Black Friday sale at the Works bookshop, of all places, a couple of years ago. Which leaves me with my two main guitars: A Lâg Tramontane T100 ACE; and an Epiphone EJ200CE. Prices first of all, just to see we’re comparing like with like. I bought the Lâg a few years ago, but it currently retails at around £350 – £360 (although I found it quite tricky to track down in this country now; a lot of the sites were American). The Epiphone is currently on Gear4music.com at £360, so, in other words, they’re pretty much both firmly in the mid-price range for acoustic guitars, not being the cheapest by any means, but certainly not up there in the stratospheric levels you can shell for a bit of wood and six strings. Looks? Well, here they are together. Both, to my mind, beautiful in their own way: the Lâg, at least so far as I know, not trying to copy any other maker’s guitar, and with that distinctive headstock and the wee Knights Templar stylee cross at the soundhole. The Epiphone, of course, very definitely is trying to copy another guitar, namely the Gibson J200, a fabled model that’s been used by Elvis, Dylan, Lennon, Harrison, Jimmy Page, Emmylou Harris, etc, etc. Like the Lâg, it’s available in a range of finishes, and I was very tempted by the sunburst version before plumping for the all black model: a mean looking machine, indeed. (Gibson have 20 more facts about the original J200 if your curiosity isn’t sated). As an aside, I’ve never quite understood how, or why, guitar makers put up with others making copies of their models: in any other context, you’d think the original makers would be suing the copyists’ asses just as quickly as they could make it to the patent office. However, every other guitar you see is a copy, often of famous models by either Fender or Gibson (Stratocaster, Telecaster, Les Paul, Hummingbird, etc etc). Time was, back in the 70s and 80s, when most of the copies were made in Japan (for example my Kiso-Suzuki); then, Korea became the cheapest place; these days it’s more likely to be China. In the case of the Epiphone, it was originally a company in its own right. Originating in Turkey with a Greek owner, in 1903 owners and company relocated to the US where, by the 50s, it was a main rival to Gibson for archtop guitars, at which point it was taken over by Gibson’s parent company. However, far from being bought up to be closed down, the two companies were run separately. Epiphone guitars continued to have their own name and reputation – the Beatles used them, before inevitably, trading up to the bigger cachet of the Gibson name. And there’s the thing for me. Every guitar band you see on the telly these days are either toting Gibsons or Fenders and, contrary chap that I am, that just makes me all the more determined to play something different. Plus, of course, the Gibson equivalent of my guitar costs £5,000. Yes, that’s £5,000. Could it sound nearly 14 times better than my Epiphone? No, I really don’t think so either. Because the Epiphone is a beauty in every sense. As you can see from the photo, it’s a big beast of a thing (the J, dear reader, stands for Jumbo) so it wouldn’t be for everyone (interestingly, Emmylou has her own smaller equivalent made by Gibson, the L200. Do hope the L doesn’t stand for ‘lady’). Played acoustically, it’s surprisingly quiet, with an even, pleasant, but unremarkable tone. Indeed, in the shop it nearly lost out to the Epiphone Hummingbird. And then I plugged it in. Where the EJC200 really wins out is in the quality of its electronics. With an under-saddle and under-bridge pick up, and nanoflex technology (no, I don’t really know what it means either) it sounds just fantastic when amplified. The Lâg, in contrast, sounds great played acoustically, but its electronics are, well, a bit french. So much so, that when I’m recording with it these days, I mike it up rather than using pickups. That’s not so easy live, and the best I can get from it is using the Vox amp, as described in the review of the amps. Bottom line? I’m really pleased to have both of these. For finger picking and the generally quieter stuff I do with Tribute to Venus Carmichael, the Lâg is a superb instrument. For playing in the house, again it’s a pleasure. Its tone is gorgeous. Which is not to say the Epiphone doesn’t get played in the house too. Although the Lâg isn’t hard to play, the bigger guitar is particularly easy: someone said it plays like an electric, and it actually is as easy as that to knock out chords on. Plug it in, though, even with a loud electric band, and it comes into its own. Here’s a wee instrumental I’ve put up on Freesound, the excellent sound sample site. It’s basically a song that didn’t make the cut for my next album lyrics-wse, but I’ve put a bit of both the Epiphone in strum mode, and the Lâg in finger-pick mode. I’ve not done anything clever effects-wise in the production process, deliberately: just a bit of light reverb to take some of the dryness out. On other tracks, though, I’ve used the Epiphone much more extensively because, with its dual inputs and better electronics, it produces a very handy, malleable signal for tweaking. If I had to have only one of these guitars, I’d have the Epiphone. But I don’t, and for my purposes at least, they’re a near-perfect complement to each other. The Epiphone review’s long, but I love Topdazzle’s no nonsense approach.